Ministry of Home Affairs has released notifications for the recruitment of candidates as Assistant Central Intelligence Officers. There are 1430 vacant positions for which the notification is released. The candidates who are interested should go through the official website and find more details regarding the recruitment or follow the link given below. The Intelligence Bureau (IB) is India’s internal intelligence agency and reputedly the world’s oldest intelligence agency. It was recast as the Central Intelligence Bureau in 1947 under the Ministry of Home Affairs. It conducts various examinations for filling up vacancies with eligible candidates in various departments. This year IB released notification for the Assistant Central Intelligence Officer posts.Candidates who are interested should go through the notification and find the eligibility criteria like educational qualification, age limit, application fee, selection process, pay scale etc. Candidates should check all the instructions mentioned in the notification and proceed further. Candidates who are interested should go through the notification and find the eligibility criteria like educational qualification, age limit, application fee, selection process, pay scale etc. Candidates should check all the instructions mentioned in the notification and proceed further. Candidates should fill the application form in the prescribed format and proceed to pay the application fee. Application fee can be paid through debit, credit cards, and net banking as prescribed. After paying the application fee, candidates can submit the application form. Candidates should have graduated from a recognized university or institute with desirable knowledge in computers. Other details can be found in the official notification. The candidates should have a minimum age limit of 18 years and a maximum of 27 years. Other age relaxation details can be seen in the official notification. Candidates who are shortlisted from the exam will be placed in the vacant positions with pay scale of Rs. 9300 to Rs 34,800 with a grade scale of Rs. 4200. Candidates belonging to general category males and OBC candidates should have to pay Rs. 100. SC/ST candidates are exempted from paying the examination fee. 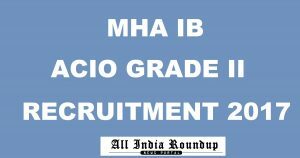 How to Apply For MHA IB ACIO Recruitment 2017? 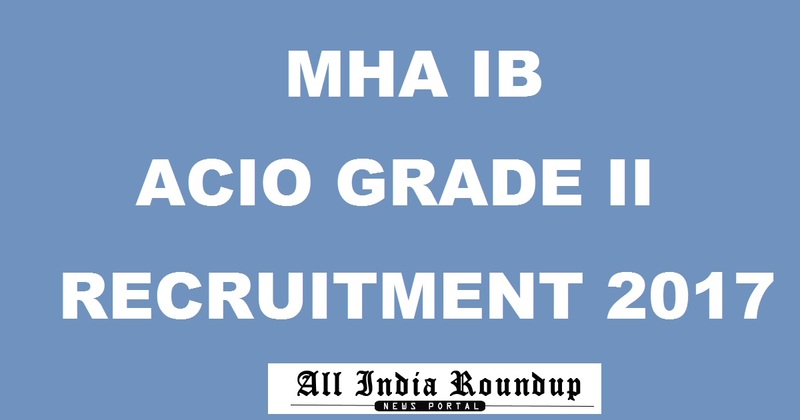 Click on MHA IB ACIO Recruitment 2017. Stay tuned to the official website for more details regarding IB ACIO Recruitment 2017. Press CTRL+D to bookmark the page for more details and exciting updates from this page.